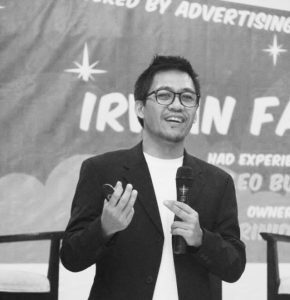 Has spent most of his professional time in the field of advertising and communication, experienced to handle wide arrays of multinational and local brands such as Unilever, Honda, Frisian Flag, Indosat Ooredo, and Wonderful Indonesia. Now the journey shifted to an equilibrium of business and social venture with Trinidad Asia, doing business advocacy to local SME’s and ecotourism project. Graduated from Visual Communication Design, Institute of Technology Bandung, with working experiences in PT Freeport, Lowe, Avicorn, Leo Burnett, colmanhandoko, Cabe Rawit, Fifty Four, Dentsu Sparks, Trinidad and Organikaya. During his career, here is the awards he achieved: Citra Pariwara, ADOI Advertising Award, AdDone Awards, Apollo Awards AdStar Asia and Asia Pacific AdFest.